Look for the Proudly Wisconsin Badge when shopping for cheese. Any brand of Wisconsin Feta can be used in this recipe. Halve feta horizontally into 2 1/2-inch thick blocks. Cube blocks into 1-inch cubes, yielding about 18 pieces. Whisk egg, flour and water in shallow, medium bowl. Place bread crumbs in another shallow, medium bowl. Dip feta cubes, a few pieces at time, into egg mixture. Then coat with bread crumbs; place on plate. Refrigerate while preparing olives. Warm olive oil in a Dutch oven over low heat. Add garlic, orange zest and fennel; cook and stir for 1-2 minutes, taking care not to brown garlic. Stir in olives and red pepper flakes. Cook and stir for 1 minute longer. Transfer olives to a serving bowl. Wipe pan with paper towel. Remove feta from refrigerator. Pour a thin layer of canola oil into the bottom of the same pan; warm over medium heat until hot. (Test by sprinkling a few bread crumbs into pan. They should sizzle.) 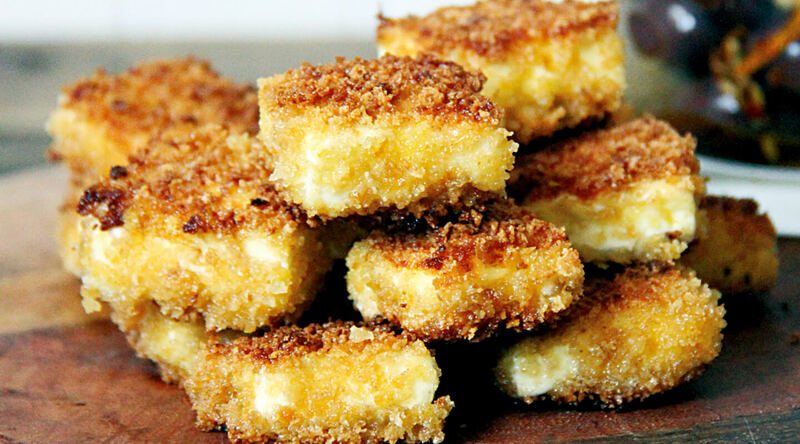 Carefully, fry 8-10 feta cubes in oil for 1-2 minutes or until cubes begin to brown. Flip cubes; cook for 1-2 minutes longer or until golden brown. Remove feta cubes to a serving platter; season lightly with sea salt. Repeat with remaing feta cubes, adding additional oil as necessary. Serve immediately with olives.